Hiking in Sequoia National Park can offer you an afternoon of fun or a week filled with adventure. Regardless of where you hike in this beautiful area of the country, you'll discover new vistas with each turn. The park is divided into several areas, and you should familiarize yourself with these areas before you go hiking in Sequoia National Park. Garfield Grove and Lady Bug Trails-Both of these begin at South Fork Campground and are four miles long. Marble Falls-This trail is seven miles long and begins near the upper end of Potwisha Campground. Middle Fork Trail to Panther Creek-Trail begins at the Hospital Rock picnic area and is approximately nine miles long. North Fork-Trail begins at the end of North Fork Drive and is 11.5 miles long. Roaring River Falls-This very short trail, which leads to a beautiful waterfall, begins at a parking area located three miles east of the turnoff to the Village. Other trails in the Cedar Grove area include Sheep Creek Cascade, Lookout Peak, Hotel Creek Trail, Cedar Grove Overlook, Hotel Creek-Lewis Creek Loop, and the beautiful Misty Falls trail. Big Stump Basin-Only one mile in length, this trail begins approximately two and half miles southwest of the Highway 180 visitor center. Buena Vista Peak-Located south of Kings Canyon Overlook six miles southeast of Grant Grove, this trail is two miles in length. Converse Basin-Another two mile trail, this path can be found six miles north of Grant Grove off Highway 180. Other trails in the Grant Grove area include The General Grant Tree, North Grove Loop, Redwood Canyon, and Sequoia Lake Overlook/Dead Giant Loop. Alta Peak-This 13.8 mile trail begins at the Wolverton picnic area.Congress Trail-This two mile path is located at Sherman Tree. Hazelwood Nature Trail-Located on the south side of the Generals Highway next to the Giant Forest Lodge, this trail is approximately one mile in length. Little Baldy-This trail, which is a little over one and half miles in length, is located 11 miles north of the Giant Forest Village. Other trails in this area include the Tokopah Falls and Trail for All People. Finally, another popular area for Sequoia National Park hiking is the Mineral King area. Keep in mind that hiking in this particular part of the park can be taxing as the elevation of the Mineral King Valley floor is 7500 feet. The Sequoia National Park combined with Kings Canyon National Park offer approximately 800 miles of hiking trails for the novice to experienced hiker to enjoy. In addition, cross-country skiing and snow-shoeing are favored winter sports as well. Outdoor enthusiasts love the park all year long as they experience the majestic Sequoia trees, wildflower-covered foothills, and the peacefulness of the woods and fields. Just as with any outdoor adventure, hiking in Sequoia National Park should be conducted wisely. Before you venture into the park on a hiking expedition, let someone know where you will be. Pack for the occasion, whether you plan on hiking for an afternoon or overnight. Watch out for poisonous plants, like poison oak. Check yourself for ticks periodically throughout the hike, and do a more thorough search once you get home. Be on the lookout for poisonous snakes, and avoid them when possible. Most snakes will not bite unless they are provoked. Be aware that wild animals, such as bears and cougars, live in the park. Keep food wrapped up tightly, and do not approach any wild animals regardless of how small or how docile they might appear! Take along a topographic map, available at the visitor center. If you plan on hiking Mount Whitney, keep in mind that reservations must be made in advance. In addition, please remember that pets are not allowed on the park's trails, and while they are permitted in the campgrounds, they must be kept on a leash at all times. 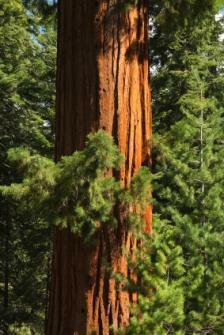 For more information, visit the Sequoia National Park Service website.